Latest Top 5 Indian Shows according to TRP. The Television has a huge audience in india and people of india loved to watch serials. so weekly BARC India Give the trp ranking for each serial and Top 5 Hindi GEC (General Entertainment Channels) Shows. Here is list of Top 5 Indian Shows From Hindi GEC. 1. Naagin (Session 2 ). Also Read : Top 10 Most Popular TV Serial in India. Naagin is an Indian supernatural drama Television series, which premiered on 1 November 2015 on Colors TV . It is produced by Ekta Kapoor under the banner Balaji Telefilms. The first season ended on 5 June 2016. Naagin was one of the highest rated shows on Indian television and won numerous awards. The second season of Naagin premiered on 8 October 2016 and airs weekends at 8:00pm IST. The first season starred Mouni Roy, Arjun Bijlani , Adaa Khan, and Sudha Chandran . The second season stars Mouni Roy, Kinshuk Mahajan, Karanvir Bohra, Sudha Chandran , Adaa Khan and Aashka Goradia. Super-naturalism, love, revenge, betrayal, violence, lust and seduction are main elements of the story. Also Read : Top 10 Beautiful Actresses of Indian television. 2. Ye Rishta Kya Kahlata Hai. Yeh Rishta Kya Kehlata Hai is an Indian Hindi language television drama that premiered on January 12, 2009 and airs every Mon-Fri at 09:30 pm on Star Plus. The show, which focuses on the daily happenings within the household of an Udaipur based Rajasthani family, is produced by Rajan Shahi's Director's Kut Productions . It has became the longest running Hindi series on Indian television by episode count surpassing Balika Vadhu . Kumkum Bhagya is a Hindi language Indian soap opera which premiered on 15 April 2014. and is broadcast on weeknights on Zee TV . The show is loosely based on the novel Sense and Sensibility by Jane Austen . Kumkum Bhagya is its Indian interpretation, which follows the life of a Hindu -Punjabi matriarch, Sarla Arora, who runs a marriage hall. Sarla lives with the hope of seeing her two daughters Pragya and Bulbul, happily married some day. The pivotal characters of this show are strong, feisty women, living together in an all-female matriarchal family. The series stars Sriti Jha, Shabbir Ahluwalia , Mrunal Thakur , Arjit Taneja and Vin Rana are in lead roles. The series is produced by Ekta Kapoor under the banner Balaji Telefilms. Continuing her tradition, Ekta Kapoor has named the series starting with the letter "K" because she feels it is lucky. The show is directed by Sameer Kulkarni and developed by Ekta Kapoor. 4. Tarak Mehta Ka Oolta Chasma. 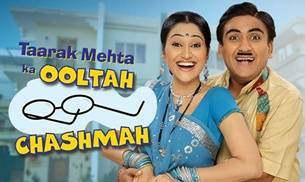 Taarak Mehta Ka Ooltah Chashmah is an Indian sitcom produced by Neela Tele Films Private Limited . The show went on-air on July 28, 2008. It airs from Monday to Friday at 8:30 pm, with its repeat telecast at 11:00 pm and the next day at 3:00 pm on SAB TV . The show is based on the column Duniya Ne Oondha Chashma written by the late columnist and journalist Taarak Mehta for Gujarati weekly magazine Chitralekha . Karmafal Daata Shani is an Indian Hindi historical period drama television series, which premiered on 7 November 2016 and is broadcast on Colors TV . The series is produced by Swastik Pictures of Siddharth Kumar Tewary. The series airs every Monday to Friday 9.00 pm. The story of the series is based on the life of God Shani, who is known for his wrath. The serial will also depict the deities Vishnu and Shiva as Shani's mentors. It also shows how tough shani's childhood appeared.